Ballinamallard's Ross Taheny with Coleraine's Jordan Allan.Picture - @Press Eye Ltd Northern Ireland. Coleraine cruised to a 3-0 win over Ballinamallard United at Ferney Park. Second half goals from Ian Parkhill and Jamie McGonigle (2) gave the Bannsiders a deserved win. 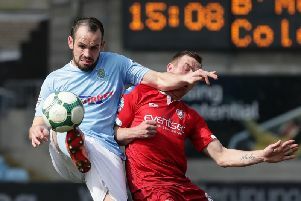 In truth Oran Kearney’s men should have and could have won by more but for the brilliance on James McGrath in the home goal. Coleraine started in confident fashiion and almost broke the deadlock on five minutes as Neil McCafferty’s cross was headed goalwards by James McLaughlin, but James McGrath managed to tip his effort on to the bar. The keeper was up quickly to block Jamie McGonigle’s follow up too. A minute later Darren McCauley tried his luck from distance, but again McGrath managed to keep it out. The Bannsiders were dominant with all the play in the home side’s half. Neil McCafferty had a free kick blocked by the Mallards wall on 24 minutes, before McCauley fired a speculative effort wide of the target three minutes later. McGonigle tested McGrath with another effort from distance on 31 minutes, but it was straight at the keeper. Rodney Brown was next to go close for the visitors eight minutes before the break as he got on the end of Kee’s corner, but his glancing header ended up on the wrong side of the upright. As half time approached the Mallards finally had some play in the opposition half, but it came from a poor clearance by a Coleraine defender. Lyndon Kane’s attempted clearance from a long free kick simply spun up in the air in front of his own goal, but Chris Johns reacted well to punch clear as Gary Armstrong closed in. Coleraine made the breakthrough 45 seconds into the second half after a great run by McGonigle teed up Parkhill, who looked to have delayed his shot too long, but he somehow squeezed it past the keeper and a defender on the line. It was almost 2-0 eight minutes later as McLaughlin headed Kane’s cross goalwards, but McGrath somehow managed to scoop the ball away. McLaughlin went close again on the hour mark after Parkhill had picked him out with a clever pass, but the striker’s effort was deflected wide of the target. The Bannsiders did extend their lead on 67 minutes as McGonigle robbed the ball off Ross Taheny on the edge of the box before coolly rounding McGrath and firing home. And the talented young forward grabbed a second with two minutes to go as he fired home on the volley from the edge of the box. Ballinamallard United: McGrath, McConnell, Elliott (Flately 8, Lafferty 61), Taheny, Feeney, McCabe, McGinty, Armstrong (Mayse 52), Lecky, McCartney, McMenamin. Coleraine: Johns, Kane, Brown, Ogilby, Douglas, Kee, McCafferty (Higgins 90+1), McCauley (Allan 70), Parkhill, McGonigle, McLaughlin.